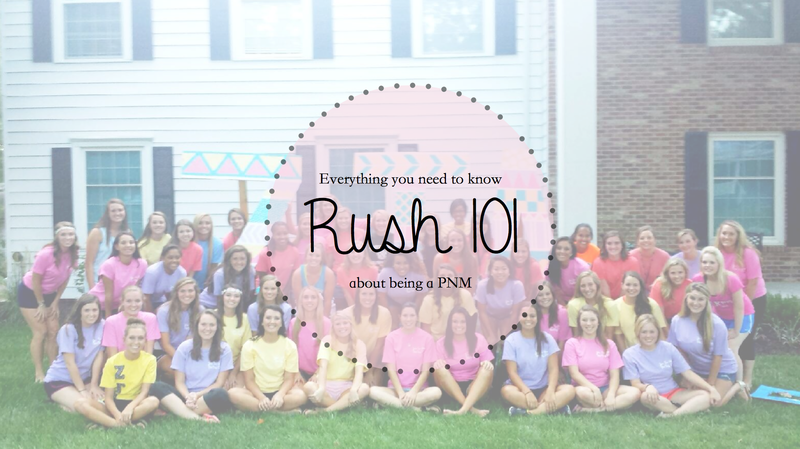 Recruitment 101 – Simple Southern Belle Answers all our questions about Rush & What to expect! As a lot of you may know, I just graduated from high school and I’ll be off to college this fall! Something I’m really looking forward to next year is getting to rush – however it’s also a little nerve racking because there’s so much that goes into it. Never fear though ladies, I have the wonderful Lauren from Simple Southern Belle here to answer all your questions! 1. How was your rush experience? My rush experience was slightly different than larger schools. We were not required to have a resume or recommendations, however we did have to sign up online and pay a fee. I was placed into a group 13. Each group had a different SRC, or a sorority recruitment counselor. These girls were there to help us make our decisions when we rushed. I went into recruitment excited and nervous. I have three sororities I was all about and wanted to be a part of. (Luckily I ended up with one of them) I walked into my first party during recruitment and boy I could hardly hold myself together. I was a nervous wreck. My new black jeans were rubbing off on my hands and I had no idea what to talk about. As the nights of recruitment went on I realized the parties I became more comfortable in and which the conversation flowed easily. Preference night came around, this is the last night in recruitment and meant to be taken seriously, I was so torn between the two houses I had left. I wasn’t sure which was going to be right for me. The night was filled with tears of joy and heartfelt moments and at the end of the night I knew the sorority that was for me, Kappa Delta. Overall rush week was long and tiring but interesting and rewarding at the end. 2.What should we bring with us rush week? 3. What should PNMs wear during rush week? Day 1: Casual, usually this is house tours or a more casual night so you’ll probably be wearing the rush week shirt they give you and then you’ll want to pair that with a nice pair of chino type shorts from say JCrew and then add a cute pair of flats or sneakers like Keds or white converse since you’ll be walking a lot. If you don’t do house tours and instead it’s more talking and party style I just either a nice pair of jeans, dark wash, or white jeans, or even a nice pair of shorts with a cute blouse. Rompers would be a cute idea for this day as well. No heels on this night! Day 2: This day gets slightly more dressy so you’ll probably stick to a nice sundress or romper again to dress it up. This day you should be wearing flats or simple wedges, heels are not necessary. Overall this day is kind of an awkward in between and you don’t want to dress up too much. Day 3: Most schools will have a day that you have to dress more business casual, which might include a pencil skirt with low heels, a cute blouse, and a blazer. Pencil skirts can be substituted for dress pants if they are flattering and the right length. Flats are also okay for this night. If you’re not required to dress business casual (your school will tell you the dress code) you’ll want to stick to dress again, but not rompers or pants at this point. Wear wedges or flats if you don’t wear business casual and keep it simple yet stylish. Day 4: For most this will be your preference round and the last night of recruitment. This is usually when sororities open up their sisterhood and share with you special songs, moments, and parts of their chapter. This night will probably leave you in tears if you’re like most girls and it can be very touching and serious. This night you may be required to wear certain clothes such as a black or all white dress. Wait to see what your school requires. If it does not specify just wear a slightly nicer dress than the previous nights. This will be dressiest night, but it is not necessary to wear a full on ball gown. And don’t even think about wearing prom dresses! Stick to a cocktail style dress that isn’t too tight to revealing along with some comfortable heels or wedges, or flats if you’re tall! Bid Day: Some schools may again tell you exactly what to wear for this day but if they don’t I suggest a pair of denim shorts, a strapless bra with a camisole over it and a pair of white converse or keds. Most sororities will be giving you shirts and gifts on bid day so you’ll want to change right away and you’ll want to make sure you’re wearing the right undergarments! 4. What are good questions to ask the girls you talk to during recruitment? -Where are you from, what is your major, name, do you have siblings? – Why did you join greek life, what made you fall in love with [insert sorority name here]? – What is your favorite about about your chapter? – What type of sisterhood events do you have? Which is your favorite? – Do you work with other organizations during events? – What leadership opportunities do you provide? – Are there library hours? Required study times? – Do they offer tutors or mentors for academics? – What events do you hold each year? and which is your favorite? – What is your favorite part about your philanthropy? – What kind of experience have you gained from working with your philanthropy? 5. What should I do to prepare for rush? To prepare: Preparing for Sorority Rush | SimpleSouthern Belle This should help! 6. What have you loved most about Greek life? When thinking about greek life and why I love it so much it’s really hard to put a finger on one thing per say. I love the fact that I found a sorority where I feel comfortable and I know that my sisters aren’t judging me. I have found my best friends for life and we share a bond unlike any friendship. I love that fact that my sisters encourage me each and every single day to push myself harder and harder till I reach my goals. Without them I probably would not be running for president of our chapter in the fall! I love the bond and special moments you have with each member because you take part in a ritual that no one knows except for you! Greek life has been the push that I needed in college to really work hard and achieve greater things. I have had job offerings, internship opportunities, leadership seminars, conventions, and more all because of greek life. Without greek life I can easily say that I would not be where I am today. If y’all have anymore questions head over to Simple Southern Belle – she has tons of great posts about sororities and recruitment!